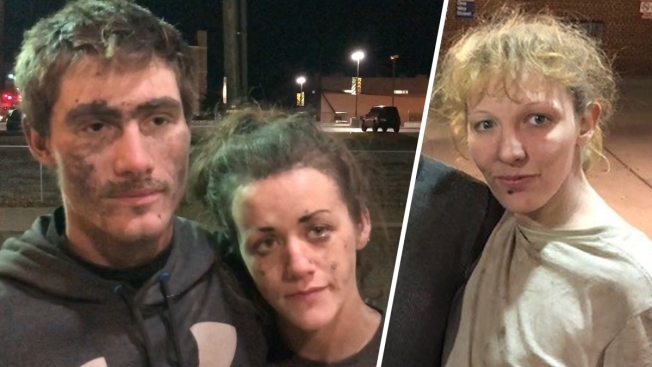 From left: Cody Beverly, Kayla Williams and Erica Treadway seen after they were discharged from a hospital on Dec. 13, 2018. The three were trapped in an inactive West Virginia mine for four days without food, drinking mine water to survive, before they were rescued. Authorities in West Virginia say they've arrested the four people who entered an idle coal mine earlier this month. Kayla Williams and Erica Treadway surrendered to authorities Wednesday on charges including entering without breaking. Authorities say they entered the inactive Rock House Powellton Mine along with Eddie Williams Jr. and Cody Beverly.